Then-Georgia Gov. Sonny Perdue visits the U.S. Embassy in Uruguay in 2010. President-elect Donald Trump plans to pick former Georgia Gov. Sonny Perdue to lead the Agriculture Department, a transition official and a source close to the process confirmed to NPR. Trump is expected to make a formal announcement on Thursday, ending a months-long process that left Agriculture Secretary as the final Cabinet post to be filled. The reported front-runner for weeks, Perdue was a member of Trump’s Agricultural Advisory Committee during the general election campaign. If nominated and confirmed, he will take charge of the USDA, an agency with nearly 100,000 employees and a $150 billion budget. The next Agriculture Secretary will help shepherd a new Farm Bill through Congress, which is due to update the regulations that govern everything from farm supports to food stamps in 2018 after a contentious bill-making process in 2014. 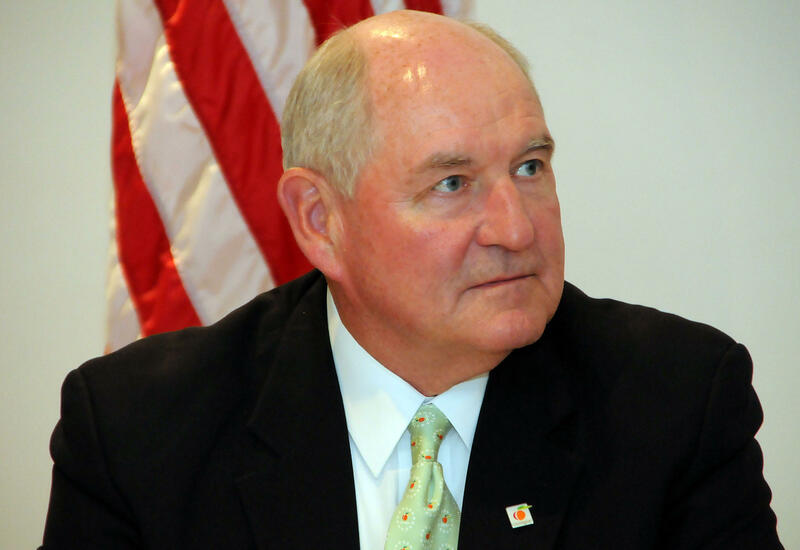 Should he be confirmed, Perdue will also be forced to walk a tricky line on trade policy. Trump has promised to take a harsher line on trade deals. Exports, however, are increasingly important to the agriculture industry says Scott Irwin, an agricultural economist at the University of Illinois. Statements by some of the nation’s largest farmer-advocacy organizations praised the reported selection – and illustrated the challenges he will face. Zippy Duvall, president of the American Farm Bureau and a fellow Georgian, applauded the reported selection. A statement from Roger Johnson – president of the National Farmer’s Union, which generally represents smaller farmers – highlighted the breadth of the Agriculture Secretary’s portfolio. “We will also ask that USDA take a proactive approach to building opportunities for rural America, increase support for conservation as a way to manage risk on the farm, and expand market opportunities for all types of agriculture production,” Johnson said in the statement. Perdue is seen by many to have a softer stance on trade and immigration policy than the president-elect. Born George Erwin Perdue III to a farmer and a teacher, according to his official state bio, he has been known as “Sonny” since childhood. Prior to serving two terms as Republican governor of Georgia from 2003-2011, Perdue was elected to represent his Middle Georgia district in the state Senate as a Democrat before switching to the GOP in 1998. Perdue, a 70-year-old Air Force veteran, earned a doctorate in veterinary medicine and has a long career operating small agribusiness and transportation companies. His cousin, Georgia Sen. David Perdue, is a member of the U.S. Senate Agriculture Committee and supported Trump on the campaign trail. A bonus fun fact: Perdue had a cameo role as a football coach in the 2006 film “We Are Marshall,” parts of which were filmed in Georgia.